One of the key attractions for consumers with regards to mobile VoIP and IP messaging applications is the misconception that they enable ‘free’ voice and/or messaging among their community of users; mobile users will still need to purchase a smart-phone and a mobile data plan in order to use the services. That the services are ‘free’ however, is not the mobile operators’ only problem. Consumers currently use OTT services because they are free, but the risk for mobile operators is that in the future, consumers use OTT services because they are better than the operators’ own services – eventually rendering the mobile operator invisible. Today’s OTT players are only having a small impact on mobile operators’ voice and messaging revenues, because the relative user base is small. But as the penetration of smart-phones and mobile broadband grows, so too will the penetration of the services provided by the OTT companies, potentially resulting in a corresponding decline in operators’ voice and messaging traffic. Mobile operators are pursuing five key strategies in order to protect their revenues from voice and messaging: do nothing, fight, neutralize, partner or emulate. Only three of these strategies are future-proof, according to Informa’s research. 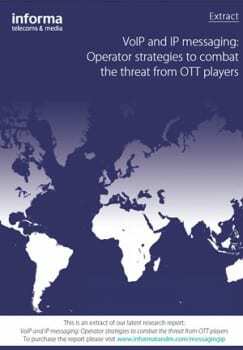 This report provides a detailed analysis of the OTT IP communications market, including an evaluation of the threat that OTT IP communications represents to mobile operators, market enablers and inhibitors, operators’ strategies for OTT communications and the outlook for OTT IP-based messaging for operators and OTT providers. The report also features seven case studies on OTT IP or messaging communications providers, including Viber Media and WhatsApp.